Convert MP4 to FLV, MKV, MOV, and other 1000+ video/audio formats. If you’ve ever been to a computer developer’s forum, you probably noticed a lot of controversy surrounding the Adobe Flash Player and anything associated with it. In fact, simply mentioning the word “Flash” is often enough to send the most energetic of developers into a frothing rage. So, what’s the big deal with Flash and what does FLV have to do with it anyway? FLV, short for Flash Video, has been widely used as the format of choice for embedded video on the web. As we know, most of currently popular video sharing websites like YouTube, Hulu and Google Video etc., mainly make use of FLV video format on their webs. If you have downloaded many MP4 files and want to share them on these video websites more conveniently or embed them on your own web, it's advisable for you to convert MP4 to FLV first and then upload the preferred FLV to websites for sharing. To accomplish MP4 to FLV conversion, you need a great MP4 to FLV converter. Wondershare UniConverter (originally Wondershare Video Converter Ultimate) is a highly functional and flexible program. Available for $39.95 per year, Wondershare UniConverter is slick, easy to use and extremely fast. It does not hog resources and may be used alongside your other programs or simply minimized and forgotten about while you’re doing something else. Better yet, its great performance means it can be installed on a low-end machine and used on a daily basis without the operating system hanging, freezing or crashing. The entire Wondershare UniConverter installation consists of several bundled products, all of which complement each other flawlessly. 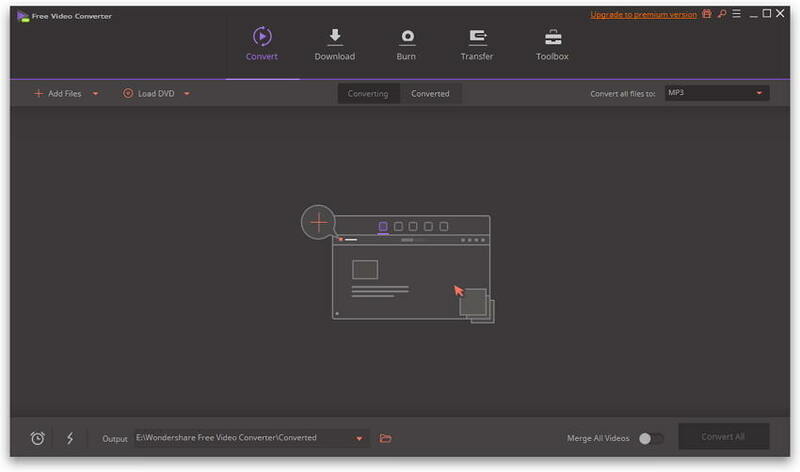 There is the Wondershare Media Server, which helps you stream content from your PC to a TV or any other supported device in one click; Wondershare Video Recorder, which captures a part or whole of your desktop and saves the action in it into a media file; finally, there is the converter program itself. Wondershare UniConverter will allow even the most tech-inept user to transform MP4 or any other media file format into FLV with utter ease and can convert files into a wide variety of formats, covering all smartphone manufacturers and all video game consoles, including PS Vita. 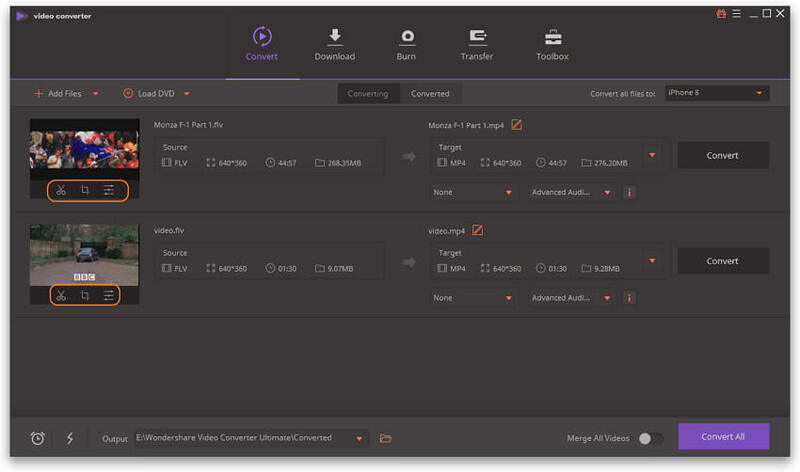 Directly convert MP4 to FLV, AVI, MKV, MOV and other formats. Step 1 Add MP4 file to the MP4 to FLV converter. Once you have downloaded, installed Wondershare UniConverter, and enter the main interface of the software, click on the button Add Files and select the target MP4 file from the pop-up window. Step 2 (Optional) Edit the MP4 file before conversion. Once the file is loaded, you can edit it by clicking on the Edit buttons below video thumbnail, and then trim it, crop it, add subtitles or a watermark etc. Step 3 Select the target format and start converting MP4 to FLV. Click on the drop-down menu located near the Convert all files to label and choose the FLV format and the resoltuion from the Video tab. When you’re ready, click the Convert All button at the bottom-right corner. Once the conversion is finished, your file is ready. You can check the converted files in the Output tab in the middle of the main interface. For those of us who can’t be bothered to read the fine print, there are tools that can make our lives easier. But, when it comes to software, all it takes is one paragraph slyly squeezed into a page, leading to a botched installation process or a program that surreptitiously installs unwanted programs to make us want to throw our hands up and forever give up on the idea of free software. In the end, users have very simple demands – give them software that works. Wondershare Free Video Converter is one of those programs that simply work. Not only that, but it is actually quite good. Wondershare Free Video Converter is a one-stop MP4 to FLV converter freeware to converting media files that turns your desktop computer into a powerful transforming machine, easily taking media files and producing something specially suited for each of your devices. Expect to have all your devices neatly arranged next to a computer with Wondershare Free Video Converter, as it can convert media files to fit native file formats of all devices imaginable. This includes all major consoles and smartphones. Even better, if a device isn’t supported right now, it will most likely be in the near future, as each new update to Wondershare Free Video Converter is adding support for even more formats, such as WTV, OGV, MXF, VRO in the 6.5.0 version. Step 1 Add the target MP4 file to this free video converter by drag & drop or by clicking the Add Files button. If you want to add more than one file and merge them into a single file, check the box below titled Merge all videos into one file, which is a great way to create compilations and DIY-albums. Step 2 Click the Convert all files to: drop-down menu to open the format list and choose FLV from the Video tab. Step 3 You can edit the file before the conversion by clicking the Edit icons to trim, crop or add subtitle to the video. Step 4 When you’re happy with the changes, click the Convert All button and wait for the program to finish converting MP4 to FLV free. If the process of software downloading and installation is not your cup of tea, then online converters are there to look after your needs. There are a number of online converters that allow converting MP4 to FLV in addition to other popular formats. Moreover, the majority of these converters are free to use and thus a pocket-friendly option. One such MP4 to FLV converter is Online Convert. This decent program supports more than 45 formats to be converted to FLV and allows uploading file from PC, Google Drive, and Dropbox along with its URL for conversion process. Additionally, output file parameters can also be edited to enhance the overall movie experience. Step 1: Open https://video.online-convert.com/convert-to-flv on your PC. Click Choose file to browse and add the MP4 file from your PC. Alternatively, you can also add the file from Dropbox or Google Drive or enter its URL. Step 2: To edit the file parameters, make changes under the Optional settings. After the conversion, the FLV file can be downloaded from the given link at the program interface. Supports limited formats for conversion. Does not allow adding multiple files at a time for conversion. You can also learn more on how to convert MP4 to FLV online if you're interested. Above part of the article lists 3 solutions to convert MP4 to FLV. Each of these methods has their associated pros and cons. Depending on the number of files you have, speed needed, and other factors, you can select the most appropriate solution. Considering the above table and listed features it can be concluded that Wondershare UniConverter is the best choice among all. Not only the software supports all types of formats, it allows editing, burning DVD, downloading videos and all this at a super fast speed. Description High-quality media file format, originally intended for use with screencasts and interactive on-demand streams. MP4 is a highly popular container format used to store video, audio, and subtitles data. Stores like iTunes use this container format and it is used interchangeably in all mobile devices.